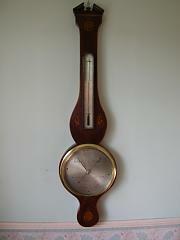 Mercury wheel barometer and alcohol thermometer by Joseph Barelli and co., from Reading. Mahogany veneer case with ebony edge line, and broken pediment top. Silvered brass main scale protected by a concave brass bezel. Superb quality, early 19th century, mahogany cased mercury wheel barometer with 8” scale and alcohol thermometer, by De Ambrose, from London. Case is decorated with triple strung edge lines of boxwood and ebony, and floral and shell paterae. Note the quality of engraving to the main scale. 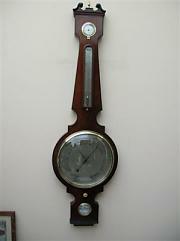 Mahogany cased 8" dial mercury wheel barometer and alcohol thermometer by P. Donegan and Co. Fecit. Case decorated with floral and shell inlay. Boxwood line to case edge. 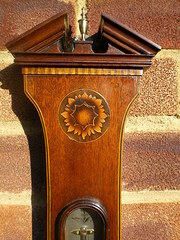 Mahogany cased 8" dial mercury wheel barometer and alcohol thermomenter by Joseph Somalvico and co. 81 Holborn, London. Triple strung boxwood and ebony edge lines to case. 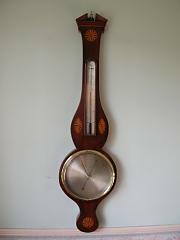 Mahogany cased 8" dial mercury wheel barometer and alcohol thermometer by D. Martinelli, 19 Leather Lane, London. Case decorated with floral and shell inlay. Triple strung boxwood and ebony edge lines. Scale engraved with horizontal weather positions. 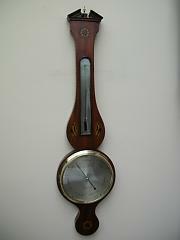 Mahogany cased 8" dial mercury wheel barometer and alcohol thermometer by G. Cattely and Co. Fecit. Case decorated with floral and shell inlay. Chequer stringing to case edge. 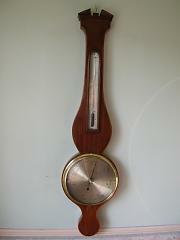 Mahogany cased 8" dial mercury wheel barometer and alcohol thermometer by F. Nago, Manchester. Case decorated with floral and shell inlay. Chequer stringing to case edge. 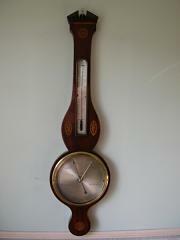 Mahogany cased 8" dial mercury wheel barometer and alcohol thermometer by S. Baranzino and Co. 3 Long Lane, London. Case decorated with fan inlay. 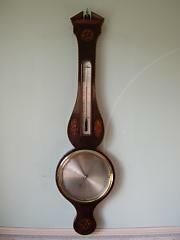 Mahogany cased 10" dial mercurey wheel barometer by Anthony Bulla, 134, Fair St., Exeter, Devon. Ebony edge line border to case with scroll pediment.